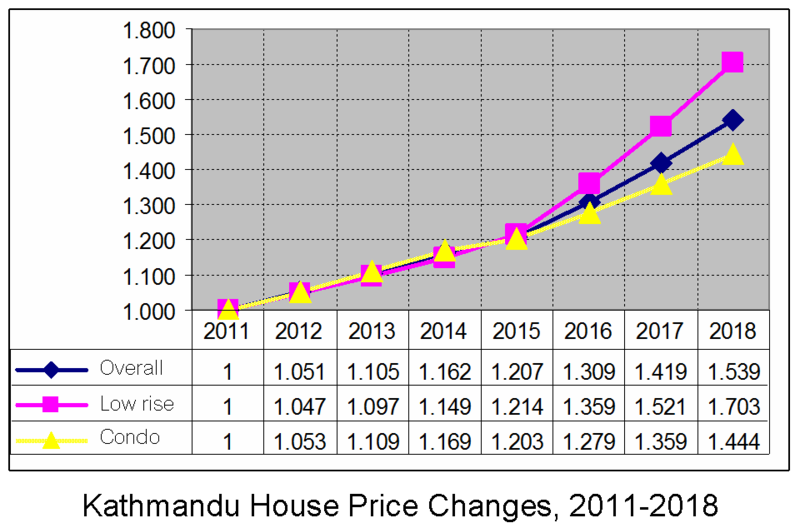 Many believe that the 2015 Nepal Earthquake affected a lot on property prices in Nepal particularly in Kathmandu. Dr.Sopon Pornchokchai, Director, Thai Real Estate Business School went to conduct a survey sponsored by Mr.Om Rajbhandary, Executive Chairmand of the Brihat Investment in March 17-23, 2018. Let see a preliminary results. The April 2015 Nepal earthquake killed nearly 9,000 people and injured nearly 22,000. It occurred at 11:56 Nepal Standard Time on 25 April, with a magnitude of 7.8Mw or 8.1Ms. It was the worst natural disaster to strike Nepal since the 1934 Nepal–Bihar earthquake. Hundreds of thousands of Nepalese were made homeless with entire villages flattened, across many districts of the country. Centuries-old buildings were destroyed at UNESCO World Heritage Sites in the Kathmandu Valley (https://bit.ly/1Njh7sP). The report on the destruction of buildings might be exaggerated. The Guardian reported that "More than three-quarters of the buildings in Nepal’s capital, Kathmandu, are uninhabitable or unsafe following the 7.9-magnitude earthquake nine days ago, a new survey has revealed". Then it reported that "Assessments of 2,500 buildings carried out by more than 1,000 local engineers during the last four days have revealed that a fifth are no longer habitable and three-quarters need repairs before they can be considered safe" (https://bit.ly/2xt7e6u). However, most of the repairs are minor ones. Most of the buildings could be repaired and are still there today. Those no longer habitable were mostly very old buildings, mostly over 100 years old. According to the survey of Dr.Sopon, there is only one condominium project which could not be fixed because of major damange. It was said that this project was permitted for 14 storeys but actually built for 18 storeys. Considering price changes, 2011-2018 for investment purposes, it was found that price changes was around 9.0% per annum particularly during the past few years. However, the return on investment from rent was only 3.6% per annum. This implied that it would not be attractive for those who bought the assets for rental purposes. The appreciation of prices was higher in the case of low-rise housing rather than those condominium units. Prior to the 2015 earthquake, condominium prices seemed to increase a little higher the those low-rise housing. However, after the earthquake, the appreciation of prices of condominiums were lower than those low-rise housing. 7.5% per annum for condominium (owner-occupied apartments) projects. In sum, the value of properties have actually been increased over time. There is no actual drop in the value. Particularly, one year after the earthquake, there was no market because the condominiums were in the repair period. However, the prices was gradually increased and found an average increase of 7.5% per annum; whereas, other low-rise residences had a higher increase at 14.2% per annum. People might feel more comfortable to live in condominiums now.